Good morning, MGTA community! 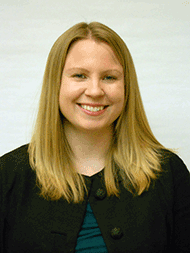 I’m very excited to take over the reins as MGTA’s 2016 President! It was wonderful to see so many of you at our annual meeting on February 4 at Pinstripes. We had more than 160 people register, which was fantastic! I do promise to find a way to make the buffet line go a little faster next year. At the event, it was my pleasure to award the Port of Halifax as the MGTA Importer/Exporter of the Year. The port achieved great things in 2015 – including the addition of post-Panamax cranes and welcoming its first 8000 TEU vessels. Later in this newsletter you’ll see a profile on the port and more of the reasons we chose them. You’ll also see that we’ve got some great events coming up! In March, we will host a seminar on Foreign Trade Zones and a networking lunch on TPP. Thank you to our education and membership committees for organizing our bustling events calendar – the February Classification Workshop at 3M was a huge hit, and we hit our capacity! On a personal note, I look forward to meeting with each of you this year – whether at seminars or in one-on-one meetings. The MGTA’s success flows from our members reaching out with what’s working, where we can improve, and what they’d like to see in programming. Please feel free to contact me with your thoughts, suggestions, or meeting opportunities! Effective from 1 July 2016, with the SOLAS (Safety of Life at Sea) amendment covering container weighing regulations, a packed container will no longer be allowed to be loaded on board vessels unless its Verified Gross Mass (VGM) has been provided by the shipper to the ocean carriers and/or port terminal representatives prior to the load list cut-off date. The Verified Gross Mass (VGM) is the weight of the cargo including dunnage and bracing plus the tare weight of the container carrying this cargo. SOLAS requires the shipper to provide VGM in a “shipping document”, either as part of the shipping instruction or in a separate communication, before vessel loading. Method 1: Requires weighing the container after it has been packed. Method 2: Requires weighing all the cargo and contents of the container and adding those weights to the container’s tare weight as indicated on the door end of the container. Method 2 will not be practical for shippers of bulk commodities like scrap, grain, etc., and it will be up to local authorities to grant permission to use this method. If the VGM information is not shared in time by the shipper, then the containers will not be loaded on board the vessel – with no exception. With whom (or in whose name or on whose behalf) a contract of carriage has been concluded with a shipping company. Shipper will need to provide VGM information of their containers on shipping instructions – no matter whether they send this documentation manually via the ocean carrier’s website (if applicable) or via EDI. Shipper will need to plan for VGM in the shipment cycle. Shipper needs to establish a process between supply chain members (forwarders, truckers, terminals and shipping line) integrating weighing service. Shippers need to calculate the potential cost impact for arranging this service as they are legally responsible to obtain and provide VGM. Shippers need to be aware of possible local legislation regarding government imposed penalties/fines. If a shipper does not comply and provide the VGM information in time, the carrier and the terminal representative will not load the containers on the vessel. Steamship lines will assess impact of VGM regulations issued by governments. Their aim is to ensure an easy submission of VGM for our customers and easy information exchange with terminals. The IMO regulation is clear that no container shall be loaded on a vessel unless a VGM is provided – with no exceptions. It is, therefore, the terminal operator’s obligation that a VGM exists before including containers in the final stowage plan. Ocean carriers will ensure that the final load list only includes containers with a VGM. Local and national legislation will dictate the consequences of loading a container without a VGM, and terminal operators naturally need to be aware of this. Terminal operators will receive the VGM information either from the shipper or from the ocean carrier, and will need to have EDI or other processes in place to receive and process this information. If the VGM is obtained by weighing at the terminal operator’s premises, the terminal operator needs a process to send this VGM information back to the carrier. Ocean carriers such as Maersk Line will liaise with all terminal operators to ensure that a process is in place. In rare cases, terminals may weigh a packed container for which a VGM has already been communicated. Where different, the VGM arrived at by the terminal will be used. Other vendors that are not part of the SOLAS Amendment – providing services such as barge, rail, depot, trucking, etc., at origin – may be included in the delivery of information relevant for the SOLAS Amendment where this is practical. In June 2015, the U.S. Supreme Court declined to review the U.S. Court of Appeals for the Federal Circuit’s September 2014 ruling holding the president of Trek Leather Inc. personally responsible for penalties related to violations of U.S. Customs and Border Protection (CBP) laws. United States vs. Trek Leather held that an individual by the name of Harish Shadadpuri (Trek Leather) — who did not act as the importer of record but who participated in activities giving rise to customs violations — could be held directly liable for negligently providing information on imports. Under this decision, import managers and compliance personnel can now be held personally liable in circumstances other than fraud for imports that violate U.S. custom laws. In its decision, the Court focused on those who “introduce” goods into U.S. commerce — potentially anyone who creates documents or facilitates documents being used to enter goods into US commerce. In the case, the importer of record (Trek Leather) failed to include fabric assists in the price declared for men’s suits. Under customs law, the cost of fabric assists provided to foreign manufacturers — which are then incorporated into imported suits — are required to be included in the price actually paid or payable. U.S. Customs and Border Protection (CBP or Customs) determined that the entry documentation failed to include the costs of the assists in the price of the suits, which lowered the amount of duty payable to CBP by Trek Leather. Mr. Harish Shadadpuri was the president and sole owner of Trek Leather. Mr. Shadadpuri argued that he could not be held personally liable for underdeclaring the value of the goods because he did not serve as the importer of record. The Court then found Mr. Shadadpuri was grossly negligent in “introducing” goods into U.S. commerce when he transferred ownership of the goods to one of his companies acting as the “importer of record” (from another one of his other companies) and furnished commercial invoices understating the value of the goods to his customs broker. Of critical importance, the Court emphasized that its decision “does not require any piercing of the corporate veil” and that Mr. Shadadpuri is not being held liable “because of his prominent officer or owner status,” but because he personally violated the statute. In the wake of the ruling in Trek Leather, corporate personnel tasked with overseeing import and customs compliance functions have expressed a fear that the court’s interpretation of the penalty statute substantially expands the scope of personal liability under the customs laws. That fear may be well-founded because the court’s broad interpretation of the terms “person” and especially “introduce” suggests that such personnel may be personally liable for customs penalties based on any of a variety of pre-importation actions that violate the customs law. The U.S. Department of Commerce will issue countervailing duty and anti-dumping orders on certain types of uncoated paper imported from several different countries. The uncoated paper at issue is generally used as copy and printer paper, as well as for books, instruction manuals, inserts, business forms, flyers, maps, and brochures. On February 9, 2016, the U.S. International Trade Commission (ITC) ruled that China, Brazil, Indonesia, Australia, and Portugal had violated U.S. trade laws, and that U.S. paper manufacturers were materially injured through dumping of uncoated paper into the United States “at less than fair market value.” In addition, in the cases of China and Indonesia, there was a finding that government subsidies from those two nations were involved. All six ITC commissioners voted in favor of the ruling, which affirmed last year’s preliminary ruling by the U.S. Department of Commerce (“Commerce Department”). The anti-dumping complaints were filed by the United Steelworkers of America, Domtar Corp., Finch Paper LLC, Glatfelter Company, and Packaging Corp. of America. Generally, a countervailing duty investigation is meant to determine whether foreign governments are unfairly subsidizing their producers/ exporters, while in an anti-dumping duty investigation, dumping occurs when a foreign company sells a product in the United States at less than its fair value. Information is collected by the Commerce Department to determine whether, and to what level, unfair government subsidization and/ or dumping has occurred. The Commerce Department findings are then reviewed by the ITC, which is an independent, quasi-judicial Federal agency that, among other things, investigates the effects on domestic industries of subsidized and/or dumped imports. When a foreign company has been found dumping and/or to have received unfair subsidies, and the ITC finds that the relevant U.S. industry has been materially injured or threatened with material injury as a result of the unfairly-traded imports, an order will be issued to collect duties equal to the amount of subsidization or dumping. As a result of the ITC’s affirmative determinations concerning uncoated paper, the Commerce Department will issue countervailing duty orders on imports of that product from China and Indonesia, and anti-dumping duty orders on imports of that product from China, Brazil, Indonesia, Australia and Portugal. By Jakub Kowalczyk, Purolator, Inc.
With the re-authorization of the Export-Import Bank of the United States (EXIM) we will take a brief look at what is EXIM, why EXIM was created, and EXIM today. Like many cases in Washington, DC, the lapse in authorization and subsequent re-authorization have a political aspect; we will not cover those in this article. The Export-Import Bank of the United States (EXIM) is the official export credit agency of the United States. EXIM is an Independent, self-sustaining Executive Branch agency. When private sector lenders are unable or unwilling to provide financing, EXIM fills in the gap for American businesses by equipping them with the financing tools necessary to compete for global sales. EXIM assumes credit and country risks that the private sector is unable or unwilling to accept. The Bank’s charter requires that all transactions it authorizes demonstrate a reasonable assurance of repayment. EXIM consistently maintains a low default rate, and closely monitors credit and other risks in its portfolio. The current EXIM Bank has its origins in two predecessor banks. Both were created as part of the New Deal response to the Great Depression and established in February and March of 1934. In 1936 the Second Export-Import Bank’s charter was allowed to lapse, with its functions transferred to the first Bank. The charter for the first Bank was extended and, in 1945, it was superseded by the present EXIM Bank. Like many organizations, EXIM’s focus and activities have changed to meet the changing demands of the US and global economy. Currently, EXIM provides direct loans, loan guarantees, and export credit insurance as a part of U.S. export promotion efforts to contribute to U.S. employment. From 2009 to 2014, EXIM has supported a total of $235 Billion worth of exports from 7,500 businesses, almost 5,000 of which are small businesses (approx. two-thirds) in the U.S.
Minnesota and neighboring states have directly benefitted from EXIM from 2009 to 2014. Over $7 billion in exports were supported – impacting almost 500 businesses, with 280 being small businesses. In summary, nearly 85 other export credit agencies around the world are trying to win jobs for their own countries. EXIM Bank helps level the playing field for American businesses to ensure that U.S. companies do not lose out on a sale because of attractive financing from foreign governments. The Port of Halifax is a full service, big ship port connecting to 150 countries worldwide. Low dwell times, available capacity, deep berths and reliable labor combine to make the Port of Halifax an efficient and competitive cargo solution. Since 2004, over $250 million has been invested in port infrastructure to ensure Halifax is ready to handle larger vessels. With over 16 meters draft at each container terminal as well as extended piers and post-Panamax cranes, Halifax can triple capacity with no significant changes to infrastructure. In August, large vessels (as defined as over 8000 TEU) started calling Halifax. The first to arrive was the 334-metre, 8,478 TEU CMA CGM Vivaldi, which called at the South End Container Terminal operated by Halterm Container Terminal Ltd. on August 3, 2015. The new weekly service is in partnership with the Ocean Three Alliance which also includes China Shipping, United Arab Shipping Company (UASC) and Hamburg Süd. Halifax is now the first port of call on the O3 Asia – North America service (Columbus-AAE1-AUC1) via the Suez Canal, linking Halifax to ports in South China (Hong Kong and Yantian), Vietnam (Vung Tau) and Malaysia (Port Kelang). At the same time, an upgraded G6 service at the Port of Halifax is now underway. The Budapest Express, an 8,749 TEU, 335-metre Hapag-Lloyd vessel which is part of the G6 Alliance, arrived August 7, 2015 at the Fairview Cove Container Terminal, operated by Ceres-Halifax. The larger vessel call is part of a service expansion for the G6 Alliance and Zim Integrated Shipping Services. An outbound call out of Halifax has been added to the existing AZX service. The G6 Alliance carriers are APL, Hapag-Lloyd, Hyundai Merchant Marine, MOL, NYK and OOCL. On October 17, 2015, the 9,034 TEU UASC Zamzam called on Halifax, one of the largest vessel calls to date. Big ships in that range are among the largest deployed along the East Coast of North America. To support the new services, the Halifax Port Authority recently developed an enhanced web-tracking tool for importers and exporters moving containers through the Port of Halifax’s container terminals. The existing site, Halifax Gets It There (www.HalifaxGetsItThere.com), has been updated to include several new features. Importers and exporters can now track containers by setting automated alerts that are sent back to them by email or SMS. Users can enter a single container number or upload a larger list of files and identify the specific alerts they wish to receive. Outreach efforts undertaken by the business development team are having a positive impact. On February 4, 2016, the Midwest Global Trade Association (MGTA) presented representatives from the Halifax Port Authority with an award for importer-exporter of the year. Building on this momentum, the Halifax Port Authority continues to find new ways of reaching out to customers and making it easier to do business through Halifax. Should We Worry About the Stock Market? The stock market has had a rocky start to 2016, prompting fears about the health of the broader economy. But the labor market seems unfazed — how much should we worry about the stock market’s recent turmoil? Following the 2008 financial crisis, the stock market was a rare bright spot — GDP growth was sluggish and unemployment remained persistently high, but equities seemed to be on an unshakable upward trajectory. The S&P 500 regained its prerecession high in the spring of 2013, when the official unemployment rate remained at 7.5 percent. Investors were confident that better times lay ahead. Now that the broader economy is finally recovering its strength, the stock market seems to have lost momentum. After briefly rallying from a September slump, equities started the new year with another round of steep losses. Is the stock market signaling a broader economic slowdown ahead? Outside of equity prices, there's little corroborating evidence that the economy is beginning to falter. It's telling, then, that recent headlines featured a weaker-than-expected survey of non-manufacturing supply managers — this relatively narrow and tangential measure of economic activity was highlighted by analysts seeking to validate their anxiety. Meanwhile, the much more comprehensive and reliable ADP national employment survey reported steady private-sector job creation in January. Weekly layoff figures showed no signs of mounting distress among the nation’s employers, and the nonfarm payroll estimate showed that labor income rose at a healthy pace, supported by longer work schedules and faster average hourly earnings gains. Of course, the labor market’s strength does not mean that the headwinds facing the stock market are imaginary. The continued slump in oil and commodity prices has placed real stress on large sectors of the American economy, and China’s slowing growth is undoubtedly bad news for some publicly traded corporations. However, these headwinds should be viewed in perspective — cheap oil may have slowed drilling activity in the West, but it has been a boon for consumer spending. And China’s slowdown should be a relatively minor story in comparison to strong growth at home. Today’s fears about the stock market are rooted in the mistaken belief that the recovery has been unusually slow and the economy remains fragile. While aggregate production has been relatively slow to regain its momentum, it's misleading to judge the economy’s strength by GDP alone, which has downshifted due to slow demographic growth. A far better measure of the recovery’s strength is how quickly the economy has taken up the slack capacity created during the downturn. The 2008 recession was unusually deep, leaving the labor market with considerable ground to cover; however, the economy responded by adding jobs at an above-trend pace that has outshined past recoveries. From this perspective, the recovery has actually been one of the strongest periods of growth in modern times. The stock market is inherently volatile, but equities don't always foretell the fate of the broader economy. Monetary policy is unlikely to be swayed by turmoil in the stock market — the Federal Reserve is focused on more substantial indicators, like changes in employment and inflation, that drive the health of the real economy. Without corroboration from the labor market, it would be a mistake to read too much into the stock market’s recent stumble. Iran’s history runs deep, as the country was once home to one of the oldest civilizations and now finds itself on the doorstep of reemerging as a major economic influence in the Middle East. While the country continues to balance its religious ideals with the reality of today’s globalized economy, recent lifting of sanctions provides Iran an opportunity to realize its significant potential. While the initial sanctions imposed by the U.S. were back in 1979, the UN Security sanctions and widely unified 2012 sanctions as a response to Iran’s uranium enrichment program were the most impactful; hitting the country’s energy sector and related banking and export economy. With the change of leadership to the comparatively moderate Hassan Rouhani, Iran’s successful compliance with the Nuclear Deal has led to the lifting of the oil and financial sanctions earlier this year by the U.S. and EU. An immediate result was the release of roughly $100 billion of previously frozen assets. 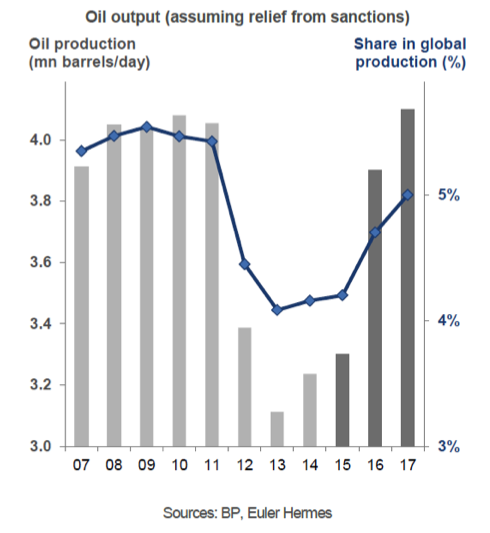 With continued diplomatic gestures, Iran reemerges with already the world’s largest known natural gas reserves and fourth largest oil reserves, which look to disrupt the already embattled OPEC nations as they scramble to cope with historic low oil prices. Iran possesses a threat to not cooperate with any potential unified stance led by Saudi Arabia, given Iran’s absence from leveraging its largest export product and already tense religious opposition to Saudi Arabia’s Sunni leadership after the recent execution of a Shia leader, only adding to the existing hostilities between the Shia-led Iran and Sunni-led Saudi Arabia. 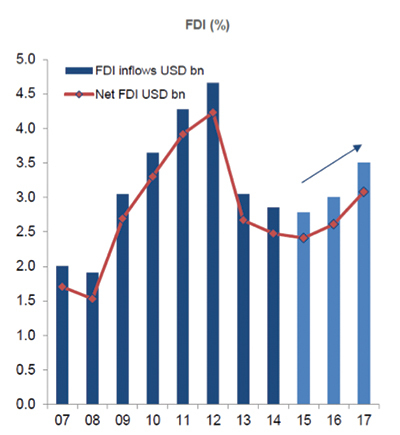 Iran has maintained very low levels of external debt and large FX reserves and in the post sanction economy looks to increase all economic metrics of growth, which includes foreign direct investment, oil output/market share, and GDP. Sector winners will largely be those in energy (which accounts for 70% of total export receipts), automotive production and registrations, and retail/consumer goods. 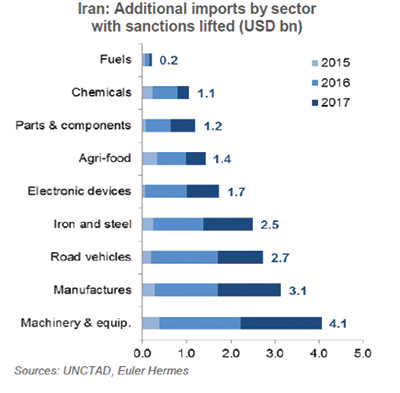 Additional import industries poised to gain are led by machinery & equipment for much-needed infrastructure updating, which will benefit countries such as Germany, China and UAE that already have long-established trade ties and offer much of Iran’s future needs. While risks still exist with the continuing geopolitical landscape in the region, the post-sanction era has already begun and has seen positive results for those interested and willing to developing relations with Iran. Do you know an MGTA member who was recently promoted or hired to an import/export company? Know of a member who recently got married or had a new addition to the family? Share the good news with your industry colleagues by emailing Kylle Jordan.